Updated, 5 p.m., clarification; 1:22 a.m.: Full story. NORWALK, Conn. – A deal specifying a $3.5 million payment to Norwalk, in lieu of a hotel atop The SoNo Collection, was approved Tuesday by the Common Council. The vote to accept the terms that would allow GGP to build its mall without a hotel, hammered out in secret by Mayor Harry Rilling, Council leaders, Redevelopment Agency officials and other Norwalk department heads, was 10-3. GGP’s mall is a game changer for Norwalk, Planning Committee Chairman John Kydes (D-District C) said, in introducing the proposal. Voting no were Steve Serasis (D-District A), Travis Simms (D-District B) and Rich Bonenfant (R-At Large). Michelle Maggio (R-District C) was absent and Doug Hempstead (R-At Large) recused himself. The proposed changes to the Land Disposition Agreement (LDA) and Urban Renewal Plan (URP) for the Reed Putnam Urban Redevelopment Plan now move to the Redevelopment Agency. Word has it approval is likely. The project would then need approval from the Zoning Commission, in a vote expected on June 8. 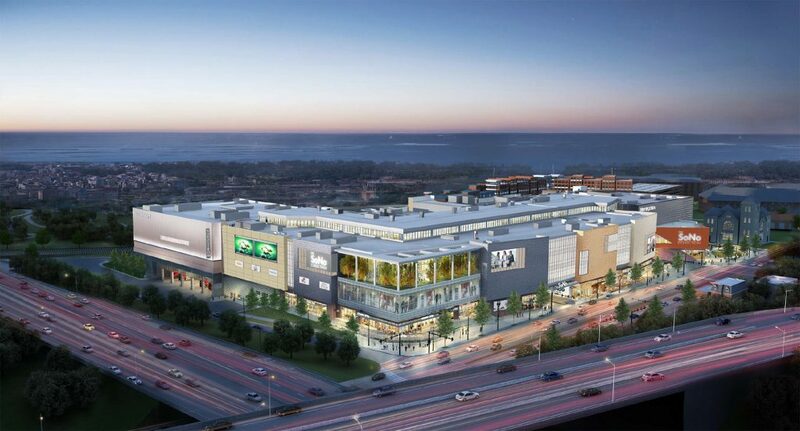 Waypointe developer Paxton Kinol urged the Council to approve the terms, saying, as a public speaker, that he was no longer concerned about a mall movie theater competing with the iPic planned by his company. No one spoke against the deal. Sallie Marsico complained of the “horrifying” plan for a video billboard on the I-95 facing side of the mall and decried loss of public real space; Bruce Kimmel (D-At Large) confirmed with Attorney Eric Bernheim, special counsel to the city, that the signage is a Zoning issue and that there is no loss of public realm space planned. Mike DePalma (D-District D) asked Bernheim if GGP had made a good faith effort to find an operator for its planned hotel. DePalma asked if the $3.5 payment was a fair tradeoff for the loss of the hotel. The tax assessor affirmed the net present value, Bernheim said. “The tax assessor also pointed out that a hotel that goes dark or is not operating to the quality of the mall beneath it would actually have an adverse impact not only on the hotel and the tax revenues generated from it but also on the tax revenues generated from the (mall) because it’s got an underperforming hotel on top of it,” he said. “I thought we could have taken advantage of the opportunity to open the door, perhaps throw out the Enterprise Zone altogether, which it was really put in the package for the last developer who just flipped it,” Bonenfant said. Norwalk needs the economic engine that the game-changing SoNo Collection represents, and people are losing sight that the project needs to get going, Council President John Igneri (D-District E) responded. The 2,100 permanent jobs promised by GGP Vice President Doug Adams is 4.9 percent of all the current jobs in the city, Igneri said. “Retail is the largest employer in the state. I think we need to move forward and we need to move forward quickly,” Igneri said. Faye Bowman (D-District B) fought for language indicating that the $3.5 million would go to South Norwalk, and won, although Bernheim pointed out it would be non-binding. The Council doesn’t have the authority to decide where the money goes, as the Board of Estimate and Taxation is involved in the process, Corporation Counsel Mario Coppola said. Bowman said there had been language in there specifying South Norwalk, language that had been vetted and could be reinserted. The language had been removed for technical reasons, Kimmel said, and it was eventually tweaked and approved to be re-inserted, with Bonenfant the only no vote. Council members agree that the money should be spent in South Norwalk, Michael Corsello (D-At Large) said. Even if Zoning approves the changes requested by GGP, there’s an appeal period, Bernheim said, explaining that the money would be available at earliest the middle of July. With that settled, Shannon O’Toole Giandurco (R-District D) talked of the painful years-long process to approve GGP’s request to build The SoNo Collection. “It’s all in our interests to get the best tenant possible,” Tom Livingston (D-District E) said. If the project is delayed because of the requested changes, which had been tweaked by legal staff, “It would be ironic if we delayed this because of this provision and lost the very tenants we are trying to keep,” he said. The $3.5 million is not a balanced deal, but $10.5 million would be, he said. NORWALK, Conn. – The Common Council on Tuesday approved the deal that was negotiated with GGP, to allow the company to build The SoNo Collection without including a hotel. The vote was 10-3. Council member Faye Bowman (D-District B) succeeded in getting language reinserted to indicate that the Council would prefer that GGP’s $3.5 million payment be spent helping South Norwalk, although that is non-binding. The mall will bring 2,100 permanent jobs, GGP Vice President Doug Adams reminded the Council at the beginning of the meeting. That’s 4.9 percent of the jobs that currently exist in Norwalk, Council President John Igneri (D-District E) said. “The retail trade… is the largest employer in the state of Connecticut. We can’t ignore that. I think we need to move forward and we need to move forward quickly.Retail is the largest employer in the state. I think we need to move forward and we need to move forward quickly,” Igneri said. It’s a much better project than what was approved in 2001, Majority Leader John Kydes (D-District C) said. Not approving it would create another story of what could have been. Serasis commented that Council members were focused on “the bauble,” the $3.5 million payment, instead of trying to get a fair share of GGP’s “pie.” He suggested that the part-time volunteer representatives were overmatched by GGP’s might. “I thought we could have taken advantage of the opportunity to open the door, perhaps throw out the Enterprise Zone altogether,” Bonenfant said. “Please don’t let us down,” Shannon O’Toole Giandurco (R-District D) said to GGP reps in the audience, after announcing that she would vote for the deal. “We don’t expect to see you guys back. We want to see a mall,” Bowman said to GGP. Thank you. Faye, for standing up for South Norwalk. Thanks also to Steve Serasis, Travis Simms and Rich Bonenfant for voting NO. The mayor and a few others brokered a deal with GGP and the town has been snookered into accepting this deal as the best offer for the City. Thank you to the few brave CC members who want something more for this City than a deal brokered behind closed doors by a very few persons who do not speak for alll of Norwalk. Really fancy shopping mall. I mean with all the brands here you kind of expect that. I find the atmosphere to be slightly snooty, but it is almost expected when people who really wouldn’t be shopping here just happen to be here because of a tournament going on at the Ritz Carlton. Surprisingly compared to other fancier malls I have been to, the food choices are not really that good. It’s mostly overpriced or bad chains like a giant Maggiano’s. The only exceptions are an OK Lebanese place, a French café known as Paul, and SweetGreens which was excellent. Let’s be honest, the loss of the hotel isn’t what changed people’s minds, it’s the fact that they realized plenty of Norwalkers didn’t want it and it was a perfect excuse to backpedal on their previous support of the mall. That hotel made no sense from the get go and I don’t think the other hotel that is being built makes much sense either. This mall is going to be build, not if, when. So let’s get on with it! It could be a good thing in the long run. Not surprising that Mayor Rilling engaged in brokering a backdoor deal. It will be interesting to follow this as it moves forward to see what other concessions were granted by our team of “negotiators”. I for one will NEVER EVER step foot into this disaster of a development. I appreciate Faye’s vision on helping South Norwalk with the 3.5M. I’d love to hear her thoughts on how she would spend that money in an opinion letter submitted to NON. Editor’s note: This comment has been disallowed because it insults another commenter, a violation of the comments policy. The SoNo Collection was not a deal “brokered behind closed doors”. Over the past few years several meetings have taken place ab City Hall as well as sponsored by the GGP group at NCC and other venues. I attended many of these meetings. I am in favor of the SoNo Collection, but others who attended the meetings had their say in presenting their objections. Now is the time for acceptance and looking forward to what it will bring to Norwalk and the Fairfield County area around us. What it will “bring,” Celeste Champagne, is MORE TRAFFIC (and, in 10 years, another ghost mall). Yay us. The loss of the Hotel is no big deal, remember there is already a Hotel on Washington St and one being built on South Main St. The only traffic that i’m concerned about is exit 16, when people drive by the the mall Northbound and say “OH look, a mall!” and take exit 16, take the right and we have a HUGE back up to Van Zant Street, where they backtrack and snake all the way to South Norwalk to the mall. It will be an absolute disaster in the summertime with beach traffic. Not to mention the brilliant lowering of the road for 18 wheelers to take exit 16 and make their way towards Winfield Street. Having one’s say at a meeting that took place during the development process does not mean that the settlement the Mayor reached with GGP on the lost hotel was transparent and included public input. IT DID NOT. While there are certainly those who oppose GGP’s development of any kind of a mall, most opponents object to the new agreement that has now led the CC to approve a change in the language for the document that governs how this property–which was obtained by eminent domain–may be used. That document is the LDA. A few people met behind closed doors, decided on a dollar amount and asked to change the LDA to accommodate the developer, who decided a hotel was no longer feasible (in other words, not as profitable as they needed it to be). We should all agree, regardless of our feelings about a mall in Norwalk, that when it comes to our city, our quality of life and our revenue sources, we deserve an open and transparent process. Thank you Nancy for your continued and excellent reporting. Thanks to the 3 CC members that voted “no”. 3.5 million dollars is a drop in the bucket….to remove the hotel, the dollar amount needed much higher. Let’s see how and when they engage the people and council of South Norwalk on the 3.5 Million. As the city taken half of the SoNCC, We need another area for the community to engage the at risk youth and job training. What would have been great before they started storing boat in it would have been 57 Chestnut Street. Once again?????? South Norwalk needs to have their eye on the long game, and the long game is best realized by investing the money strategically in better connectivity linking Historic South Norwalk with the mall, West Ave, on down to Wall Street. This was suggested Monday by Waypointe developer Paxton Kinol, and though his motivation may be partly self-interest, infrastructure improvements that will improve the tax base will do more to help more SoNo residents than trying to build 25% of a Boys & Girls Club. Social programs are great and have their place, but if the City doesn’t invest in the economic viability of South Norwalk, South Norwalk will continue to suffer, and those who own property here and are doing most of the heavy lifting for this district will vote with their feet and move to another town or a better part of Norwalk. The mall will cost the developers 400 million to build. A Manresa cleanup would cost 30-60 million. Now put that 3.5 million in its property place–building sidewalks and improving walkability. Build the tax base first, and then offer more programs. What would be “great” for the “at risk youth” is to have parents to step up to the plate, then the rest of Norwalk wouldn’t have to suffer continuing to raise them. Any money made off this build should be put forth to reducing taxes, any way possible. @Anna, I will volunteer to offer my free job training program. Wear clean clothes. Respect your boss. Don’t talk on your cell phone at work. Cover up your tattoos and piercings. These are “soft skills” and the US Dept. of Labor already spends millions in this area. Not sure why Norwalk needs another 3.5 million to get the job done. More mentoring, which should be done by volunteers, is more likely to yield positive results. Youth are more at risk when they’ve never been told “no”, when parents are overwhelmed, inattentive or absent, and when the system tells them that their problems are other people’s to fix. They’re not. We spend a breathtaking amount of tax dollars on programs like these, and the benefits are questionable. Best way to reduce property taxes? Improve the infrastructure to attract new businesses and wealth to add to the Grand List. A measly 3.5 million spread out over all property owners won’t do you or I much good. Please speak for only yourself when deciding what is “measly” amongst taxpayers. If it only “measly” then pay for my portion and show the world your do-goodness. Please volunteer your time – that’s great but leave taxpayers money out of it. Knock on those doors and get donations but leave taxpayers money out of it. Be that mentor – good for you but leave taxpayers money out of it. If you can’t afford or be responsible enough to be a parent or have parents to be your off-springs guidance, then leave taxpayers out of it. If you can’t afford or be responsible enough to be a parent or have parents to be your off-springs guidance, then leave taxpayers out of it. Meant to say, then don’t have them but if you do, then leave taxpayers out of it. @Anna, 3.5 million IS inconsequential when it’s spread out proportionally among all property taxpayers. Norwalk needs a stable and affluent tax base comprised of high value properties and other assets. The reason Norwalk pays more taxes than our neighbors is we chase the wealth away. Short-sightedness on the part of many taxpayers contributes to ongoing mismanagement and lack of long range planning and thinking. . Imagine if Norwalk needs to collect 300 million dollars to fund their 2017-18 budget, and that the 3.5 million from GGP is used ONE TIME to reduce property taxes for everyone who pays. You’ve just reduced the tax burden ONCE by 1.5%. Done once, it’s meaningless. By contrast, take that 3.5 million and invest in walkabiltiy and connectivity–sidewalks, etc.–to make Norwalk more attractive to businesses, and you increase the grand list, and in so doing, reduce property taxes across the board for a long time, not just one year. Pretty shocking that some think this 3.5 million return is going to amount to a meaningful change in their tax bill. It won’t. A few bucks this year, and then it’s gone forever. By the way, the biggest tax break would go to CL&P (aka Eversource), @Anna Russo, since they are the biggest tax payer. Is that really what Norwalkers want to do with 3.5 million dollars from GGP for the lost hotel–give money back to the public utility they’re already paying for gas and electric?